Cyclone was Windy's first son and a full brother to Sunshine. He was born on the Chincoteague Miniature Pony Farm. It is has been speculated that he might be by Al-Marah Sunny Jim as Misty II who was also born that year is by him, but sources have proved this incorrect. When Cyclone was born his grandmother Stormy had also had a foal named Misty II. Stormy rejected Misty II and refused to let her nurse. Windy adopted Misty II and allowed her to nurse alongside Cyclone. The story was fictionalized in A Pony Promise by Lois Szymanski. Cyclone remained a stallion all his life. 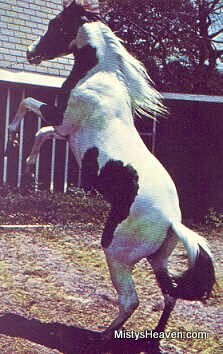 In the mid-1980's, Cyclone was regularly turned out with the Misty family mares and was allowed to breed with them indiscriminately, even his own mother. This resulted in him siring many Misty family ponies, but also caused a lot of inbreeding. Some of the foals were born with genetic defects and did not survive. While at the Pony Farm he is known to have sired Blue Skies, Gentle Breeze, Hurricane, Rain Cloud, Sunflower, Sunny, Misty's Sunpiper, Tornado, Virga, Misty's Wind Spirit, Wind Storm, and Zephyr. In 1988, Mike Pryor, who had bought Cyclone's mother and brother/son a year before, decided to buy Cyclone and his daughter Gentle Breeze. Cyclone went to live in Pennsylvania. Mike traveled around with Cyclone and the other Misty ponies, and took them to schools, fairs, libraries, and of course, back to Chincoteague for Pony Penning. Cyclone sired several more foals in Pennsylvania: Chemina Mist, Windjammer, and "Junior". Cyclone lived well into his thirties before he passed away in 2005.